A crown is a type of dental restoration which completely caps or encircles a tooth or dental implant. Crowns are often needed when a large cavity threatens the ongoing health of a tooth. They are typically bonded to the tooth using dental cement. 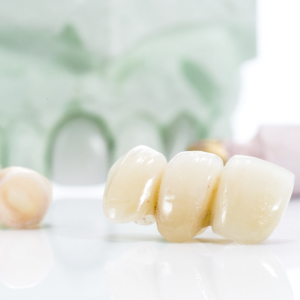 Crowns can be made from many materials, please ask one of our doctors about details. A bridge, also known as a fixed partial denture, is a dental restoration used to replace a missing tooth by joining permanently to adjacent teeth.